Japanese Wineberry Fruit Bush in a 2L Pot - Tastes Like a Raspberry! 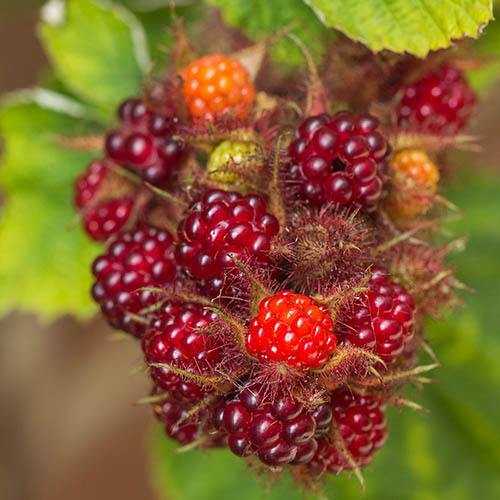 This close relative of the raspberry is really something special and is perfectly suited to UK gardens as it loves moist soils and will easily withstand the coldest winter weather. You'll get masses of fruit which ripen in July and August and have a rich raspberry taste which is enhance with a sherberty zing! They are delicious eaten fresh and make a great addition to summer puddings. This is an ideal plant to train against a wall or fence where it will quickly establish giving coils of attractive stems with pink hairs and bold lime green leaves. Treat as you would a summer raspberry, pruning out old fruiting stems to make room for new ones to grow for the following years crop.